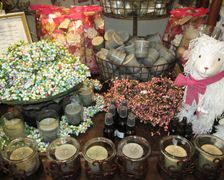 Mother’s Day is quickly approaching on Sunday, May 13 so we thought we’d provide some gift ideas for Mother’s Day. There’s are always plenty of gift ideas available in the shops in historic downtown Galveston so skip the mall, get outside and stop in at one of the many locally owned retailers. Jewelry is always a popular gift for Mother’s Day so keep these shops in mind - The Jewel Garden, 2326 Strand (Ste. 110); Santa Fe Trails, 2311 Strand; and Gracie’s, 2228 Strand. The Jewel Garden carries a huge inventory of handcrafted jewelry while Santa Fe Trails is known for their selection of Native American and Southwest jewelry and art. Gracie’s carries the popular Waxing Poetic jewelry line. All offer a variety of jewelry ideas in all prices ranges. If you are thinking buying her a nice spring ensemble – don’t guess on the size. Check her closet to be sure you get the perfect fit. You will find a wonderful selection of clothes at Tina’s on The Strand, 2326 Strand, and Head to Footsies, 2211 Strand. Tina’s carries Matchpoint Linens, Alberta Makala and Luna Luz Cottons and other lines. By the way, Tina’s is one of the top ten retailers for Lady Primrose Spa Products and Skin Luxuries and sells a Tina’s Blend Signature Candle. At Head to Footsies, you’ll find Desiqual, Miss Me, Blu Pepper, Fresh Produce and more as well as Steve Madden, Not Rated and other popular shoes. If she loves nautical décor, then put The Admiralty, Ocean Discoveries, 2211 Strand, on your list. 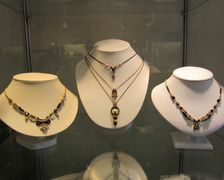 You can also find some unique gift items at Primitive African Art Gallery, 2211 Strand, second floor. If you think something sweet would make her day, then order a custom cookie at Nestle Toll House Café, 126 23rd Street. They can print your favorite family photo in icing on the cookie. 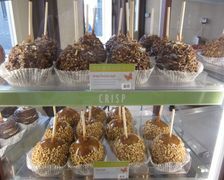 If she prefers chocolates or caramel covered apples, then try Rocky Mountain Chocolate Factory, 2211 Strand (Ste. 103). They offer 15 different kinds of apples and a wide variety of fudge and chocolates. Rocky Mountain Chocolate Factory will also custom design gift boxed filled with chocolates, chocolate covered strawberries, fudge or a combination. 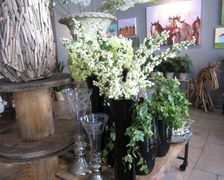 And remember that every woman loves flowers, so you can always order a bouquet, corsage or centerpiece from Downtown Blooms, 2309 Mechanic. They offer offers a huge selection of small gift items including candles, vases, plants and more and you can find them right across the street from The Tremont House. Remember that you can’t go wrong with Mother’s Day Brunch at Hotel Galvez. But keep in mind that this is the most popular brunch in Galveston so make your reservations early. Brunch includes an abundant offering of breakfast and lunch entrees, breads and fruits, seafood, pasta bar, omelette station, carving station and, of course, desserts. Brunch also includes complimentary champagne, mimosas, or red and white wine. Call 409-765-7721 for reservations. If your mother, wife or grandmother has a special connection to Hotel Galvez, then consider buying her a copy of Hotel Galvez: Queen of the Gulf which is available for purchase online, at various downtown shops or online at Barnes and Noble. Another idea is to purchase a gift certificate at The Spa at Hotel Galvez. The Spa just announced its Spring Specials which are valid through the end of June. You can also purchase gift certificates online or directly at The Spa. The businesses included in this post are tenants of Mitchell Historic Properties.